All of the judges hard work is over and the winners from the Great American Beer Festival are in. According to the BA’s Web site winners are determined based on the results of the competitive beer judging held at the Great American Beer Festival. Breweries are awarded points based on medals won, and these points are tabulated to arrive at the results. The following criteria used to rank breweries and break ties by awarding points. See Beer Competition for more information. Large Brewing Company of the Year: Anheuser-Bush, Inc.
Mid-Size Brewing Company of the Year: Pyramid Breweries, Inc.
Small Brewing Company of the Year: AleSmith Brewing Co.
Small Brewpub of the year: Redwood Brewing Co.
You can find all of the winners here. More posts to come on this. Poured from the bottle into a pint glass an amber color with a nice looking head. I think the best part of this beer is the hop aromas. They seemed to have paid attention to this and did a pretty good job with it. The taste is smooth but the hops in the nose aren’t in the body. Seems a bit watery and tingly on the tongue. A decent, no fault amber ale. Proves A-B can make a tasty product. For the price compared to taste it is ok.
Is it last call for the King of Beers? That’s the question being asked near Wrigley Field as Anheuser-Busch and the owners of a building with a huge red and white Budweiser advertisement on the roof square off in a legal battle. The new owner of the building covered the ad with a tarp, saying the beer maker didn’t pay its rent on time and defaulted on its lease. He wants to take legal possession of the part of the roof where the sign is. 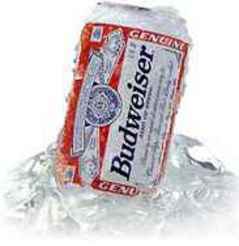 Anheuser-Busch said it tried to pay but its check was sent back. The brewer contends it has exclusive rights to the roof through next February. A Cook County Circuit Court judge Friday granted a temporary restraining order that means Anheuser-Busch can remove the tarp. Anheuser-Busch Cos. Inc. made it official on Monday when it unveiled Budweiser American Ale on draught nationwide. The Business Journal of Milwaukee said that on Sept. 29, the new amber ale debuts in 12-ounce six-packs and 22-ounce singles select retailers. Anheuser-Busch, which has worked on the new beer since 2007, touted the ale’s performance in blind taste tests. The brewer is the top domestic competitor to MillerCoors LLC, the joint venture of Milwaukee’s Miller Brewing Co. and Coors Brewing Co. of Golden, Colo.
You read a story on its release here. Ok, I am now done with writing about this release for a while.